Now that school is back, my kids needed a fast and easy breakfast in the morning. I don’t know about you, but I’m not waking up at 5am to make them pancakes and sausage before school starts! So muffins are always the perfect choice. These muffins are jam packed with fruit, oats and whole grains, which all helps my guilty mom conscience. I mean I’ve come a long way from the toaster strudels and cheese danishes we use to have for breakfast in the 90’s... but still I need to make sure the kids are not having too much sugar or carbs. This helps with both. The batter comes together quickly with a quick mix of the wet ingredients including the mashed banana, eggs, buttermilk and vanilla. Then I add in the dry ingredients which is the flour, baking powder, cinnamon and oats. Then just because I had extra bananas on hand and to up the fruit content, I added one whole diced banana. This all gets folded together and divided among the 12 lined muffin tins. Then its time for the best part… the streusel. Because this is a healthy-ish recipe after all so we need to add something decadent in here! The streusel is a crumbly mix of softened butter, brown sugar, cinnamon, oats and flour. I honestly love crumbling this whole mess with my hands, it just gives you that great wet sand feel. But if you’d rather not, a fork would work just fine. But hands are just so much more fun! Top the batter with as much of this mixture as you can and bake it off at 375F for 15 minutes or until a toothpick comes out clean. 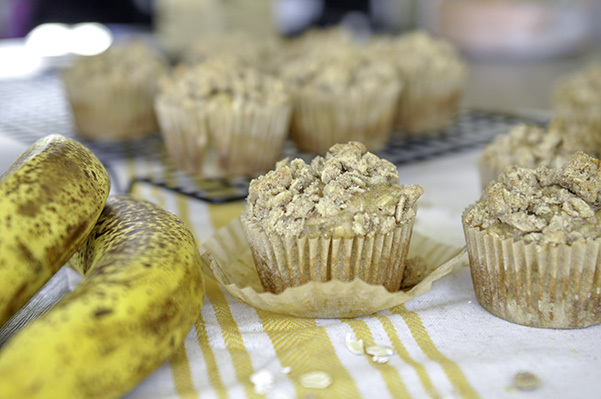 These muffins are a snap to make and come out soft, moist and loaded with banana chunks! 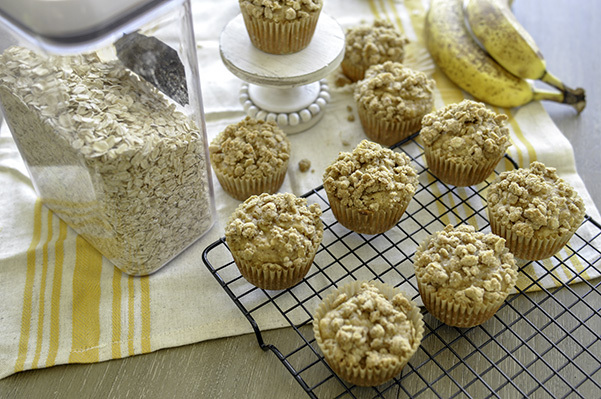 Plus the streusel on top adds a bit of crunch to create the perfect muffin bite! In a medium bowl, combine the mashed bananas, milk, oil, egg and vanilla. In a small bowl, whisk together the flour and rest of the dry ingredients. 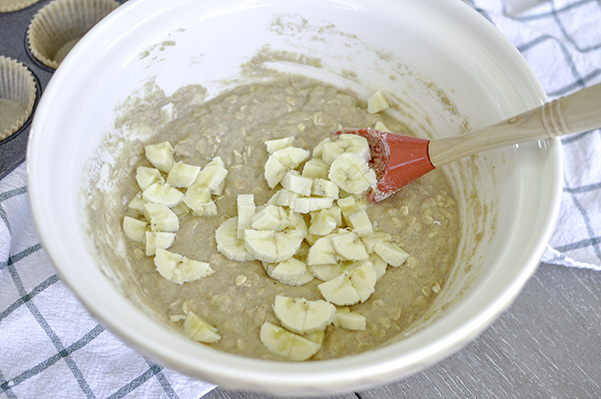 Stir the flour into the banana mixture until they are just combined. Divide the batter into 12 muffin tins. Make the streusel by combining the softened butter, flour, brown sugar, cinnamon and rolled oats. I like using my hands to squish it all together but a fork would work fine too. Once it starts to look crumbly, sprinkle it on top of the muffin batter. Bake for 15-17 minutes or until a toothpick inserted comes out clean. Enjoy right away or keep in an airtight container at room temperature for 2 days. I also freeze these and defrost overnight for a morning treat!